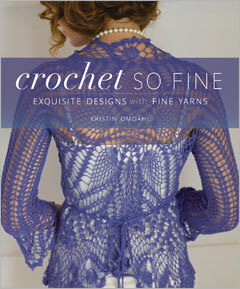 Crochet So Fine, Exquisite Designs with Fine Yarn is a new book (due for release on July 1, 2010) by Kristin Omdahl. The book provides 20 projects created with fine yarn, and with a beautiful drape. The patterns combine a variety of crochet stitches and motifs, along with larger hooks and/or longer stitch sections to provide the soft drape for each piece. Patterns include a hoodie pullover, cardigans, jackets, capes, shawls, scarves, hats, and a shopping bag. Detailed schematics are provided as needed, along with symbol crochet charts. I loved all the designs and plan to make several of them just for me, especially the Tranquil Hairpin Lace Tunic made with ribbon yarn and a combination of regular crochet and hairpin lace. If Doris Chan’s new book made me think hard about making hairpin lace, this book has me fairly itching to learn. Then there’s the Diamonds Shawl, the Chains Bucket Hat, the Spiral Waves Shawl, the Shimmer Beaded Lace Cape, and the River Tunic – mine, all mine! The book can be pre-ordered at Interweave’s website, Amazon, and other online book stores.